Sean Kelly is delighted to announce a major exhibition of photographs by Robert Mapplethorpe. 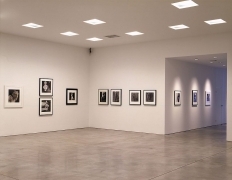 The exhibition, which opens on July 1st will continue through August 12th, and coincides with an exhibition at the Solomon R. Guggenheim Museum, Robert Mapplethorpe and the Classical Tradition: Photographs and Mannerist Prints, which also opens July 1st and continues through August 24th. This exhibition of nearly 60 images reveals Mapplethorpe's work through a radically fresh interpretation. The selection of silver gelatin prints represents several areas of Mapplethorpe's aesthetic interests including; still lifes, portraits, figure studies, body fragments and classical statues which facilitate the unique opportunity to see Mapplethorpe's work through the matrix of Neoclassicism. A style of the late 18th century, Neoclassicism was exemplified by Jacques-Louis David's paintings and the sculptures of Antonio Canova. Neoclassical artists, in homage to the Greek and Roman Classical tradition, crystallized their subject matter to a pure, harmonious form with a sober clarity and a subdued sense of color. The static, rigorous frontal view of a figure in the shallow picture plane of Neoclassical practice was often also utilized by Mapplethorpe, with striking and beautiful results. Mapplethorpe's photographs exemplify classical ideals of form and proportion with their controlled relationships between light and shadow, balance and asymmetry, beauty and obscenity, while at the same time clearly reflecting both a Classical and highly contemporary interest in the human body. Since Mapplethorpe's untimely death in 1989, his work has been the subject of numerous exhibitions in museums throughout the world, including several major traveling retrospectives. His work is widely collected, and he is unquestionably considered to be one of the most important photographers of the twentieth century.